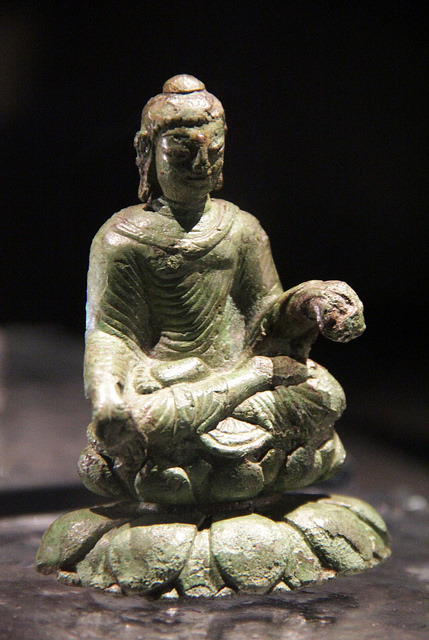 This 6th century Buddha statuette from North India was found in an old Viking trading town on Helgö Island in Lake Mälaren, Sweden. During the excavation of the Oseberg ship one so-called “Buddha bucket” was found. The findings illustrate that the Vikings traded over vast distances and had to deal with many different cultures and religions. The statuette on Helgö Island was found along with an Irish crosier and an Egyptian Coptic christening ladle. The first archaeological excavation in 1954 uncovered the remains of the early settlement dating back as far as 200 AD. The small statuette and the christening ladle were both dating from the 6th century. 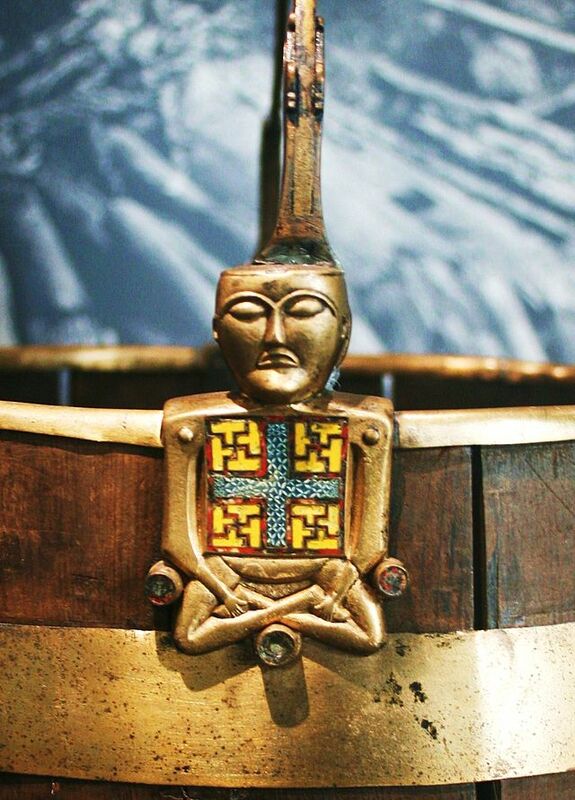 The so-called “Buddha bucket” found in the Oseberg ship got its name from a brass and enamel ornament of a bucket handle in the shape of a figure sitting with crossed legs. The bucket is made from yew wood, held together with brass strips, and the handle is attached to two anthropomorphic figures compared to depictions of the Buddha in the lotus posture. In the period 8th to 11th century the Vikings traveled throughout the known and unknown world where they trough trade and warfare met new cultures and religions: From Greenland and Vinland (North America) in the west, Miklagard (Constantinople) and India in the East, to Blåland (English: “Blue Land”, meaning Africa) in the south. With the battle axe in one hand, they had to deal with people who had a different culture, language, and color and that believed in other gods than themselves: Christians, Muslims, Buddhists and tribes that followed natural religions. There are made many exciting archaeological discoveries dating back to the Viking Age in Scandinavia, and the Buddhas are only two examples: Persian silk with beautiful patterns, strips of hammered gold of Chinese origin, peacocks and optical lenses most likely produced in Byzantium are others. See also: Did the Vikings Use Telescopes? It is well documented that the Vikings ran extensive slave trade and it is very likely that some of these “exotic commodities” were brought back home and sold in Scandinavia. The youngest of the women found in the Oseberg ship is, according To Per Holck of Oslo University, mitochondrial haplogroup U7: Her ancestors came from the Black Sea area, possibly Iran. Did the Vikings get knowledge from the slaves about other cultures and languages ​​that were helpful to them? Did they bring slaves as interpreters on their travels? And – how did these slaves affect the Vikings’ view of religion? A paradox is that Norway and Sweden were the last countries in Europe to introduce Christianity as the official religion. 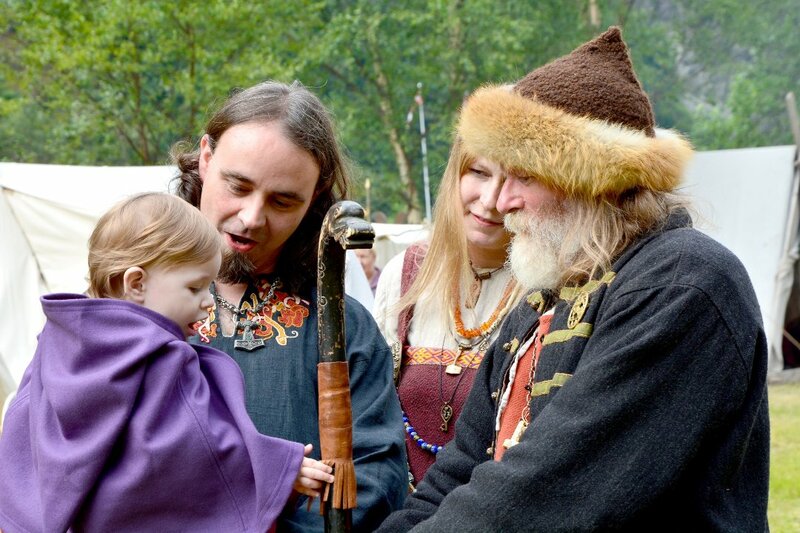 Could one reason be that the Vikings had seen and learned about other cultures and religions that they considered unfamiliar, including Christianity, and thus stayed loyal to the Norse religion that had provided security, structure and success? Most Scandinavian Viking graves are not yet excavated and are preserved for posterity. Hopefully, many of the answers lie hidden along with the remains of the most adventurous people in history. There was a Buddha traded with Swedish Vikings though this is a conflation of two found sites , the second photo picture is a Celtic barrel figure found in the Norse Viking ship in an Oslo museum either a sitting Christ or, as likely, a BCE pre-Christian Cernunnos deity figure.